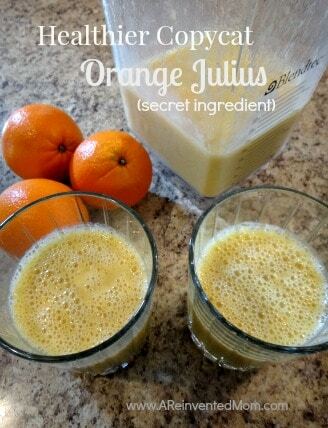 Today I am sharing one of our favorite drinks – the Healthier Copycat Orange Julius. While I’ve had the Copycat Orange Julius recipe in my recipe box for years, I’ve made quite a few changes over time to make a healthier drink, and also to suit our tastes. Even though I’ve “healthied up” my recipe, this version still tastes like an Orange Julius – a creamy, dreamy orange vanilla dreamsicle. My current version includes a surprise ingredient: yellow squash. You can’t taste the squash at all, pinkie promise. You’re just going to have to trust me on this! Confession time: I’m not a big fan of yellow squash. I’ve tried to like it (really, I have). I’ll eat it but it’s certainly not high on my list of produce favorites. The Hubby and The Teens like it even less than I do. I’m also not a proponent of hiding veggies in food but I make an exception for this recipe. If The Teens knew I put squash in this drink they would never, ever drink it again – game over. Mums the word, okay? I no longer cringe when I receive yellow squash in my Bountiful Basket because I know exactly how I will use them. 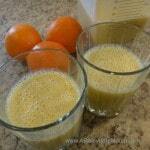 I got the idea of adding yellow squash to my Copycat Orange Julius from the Fresh Blends cookbook by Blendtec. In addition to posting the recipe as I currently make it, I am including some of the ingredients from my original version for additional options. I think this drink is sweet enough without adding any sugars or honey, though. Place all ingredients in blender jar and attach lid. Add 1 tbsp. of honey or 2 tbsp. of sugar if you like a sweeter drink. Other milks can be substituted for the almond milk.